and pink/blue dichotomies screaming at me. pushing the fairy straight to her. Why not allow them to choose? solidly drawn, sternly abided by all. likes girls who wear boys’ shoes. I'm a girl," she cries out. is unspoken, eloquent words trapped inside. for a rainbow colored, limitless childhood. even when it's the hard way. Want more preschool revelations? Read this post from yesterday about how watching my Mountain Man and his Bella cracked me open. I cant not even explain to you our battles with this. we try 100% to take away gender rolls and how color and objects don't matter but even if you want to buy tools, the girl section makes them pink, so frustrating! I hear my friends say he is such a boy all the time because a child like trucks or cars...nope it just means they are kid who like trucks and cars! That's it Courtney, totally it. And how many times do you exclaim "ah, such a boy!" with a gleaming smile ... leading the child to reach for those toys again and again. Not to say most boys will destroy while most girls will build ... but let THEM do it. Give them the same tools and the same colors and let THEIR imaginations take over. They don't need our help to figure out who they are. At about Bella's age, my oldest daughter went through a "black" phase - literally all the clothes she wanted to wear were black - cute, but still black. I let her. Today only one of three ever wears pink. Eventually the color stereotypes fade...or maybe it is just that real personalities and preferences take over and expressions are so all over the board (in high school) that nobody looks out of place any more. It's a shame that Bella has to go through this. Oh, how I hate this! One day, recently, my girl was wearing all blue. She played with two new guys at a playground. I heard one whisper to the other - ask if he's a girl or a boy. No, said the second, that's rude. I wish they could just be themselves longer. Read Priscilla and the Pink Planet, cute book. The world needs color! It is painful to watch the world shape your child in ways that limit them or take them away from who they are. My oldest little girl loved pink dresses as a preschooler. About two weeks into kindergarten she announced that pink is for babies and dresses are not OK. It tugged at my heart because I knew these were two things she had loved and she was giving them up as a result of peer pressure....already! Me, too, Kate. How did we get to place where a girl could be a boy if she dares wear a blue shirt? Why can't she just be a girl in a blue shirt? @May - I can just imagine your sweet girl's face when she realized what makes her happy was at odds with what would make others happy. It's hard to swallow that they learn these lessons so young. I'm kinda glad I didn't have a girl, I'd be p.o. 'd all the time! I still am, but just not ALL THE TIME! Hey - so do I! I wonder if we've seen each other there. 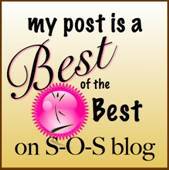 I'm actually going to share this post at Pigtail Pals over the weekend. I hate this. There is a reason I make sure Desmond has his own dolls, which yes he plays with differently then Eloise, but still plays with, and that Eloise has her own trucks and sword and light saber. It is tough when you get to the "No only boys do that" or "No that is for girls." point, because really most of the time they are toys or clothes, they are for everyone. huh - this is so interesting...my kids spent their pre-school and elementary years in france. everything there is just so much more subtle...to the point that when they were kids I just never thought about this! I had a daughter who wore whatever I handed her until she was, well, at least 12....and a son that dressed himself from the day he figured out what colors were and how to match stuff. He had a costume drawer. Changed clothes 5 times a day...she kept pj's on unless she had to dress to go out. It was just the way they were, and no one ever gave them grief for any of it! I'm sure I have no clue how fortunate I was with this!! The school year is upon us and I'm ready, once again, to fight the same battle: the fact that kindergarten kids use gender as an insult makes me crazy. Your use of concrete and strong images in this piece allows for your strong emotions to come to the fore. This piece has great weight, which makes it powerful. Thanks for this poem. You tell that beautiful daughter of yours, that she looks like Bella. Bella likes Toy Story shoes and a dark clip in her hair. It's hard to get kids to stay true to themselves among children who judge one another, but I think Bella is feisty enough to do it. The girl still refuses the shoes, so her best friend and #1 fan (Grandma) bought her some cheapie pink/yellow/green ones. I'm fighting the battle, but I can't force her to wear the shoes. I do plan to "visit" her classroom for an incognito discussion about gender, though. Sneaky! I totally understand your frustration. The amount of pink my daughter is gifted is a bit obscene. There are other colours of the rainbow. I hope your daughter comes back to the shoes. They are awesome! I wonder why the teachers didn't catch these conversations and correct the children for judging another person's choices? I figure the comments are made in the thick of play, etc. I imagine if she was openly and loudly derided or mocked, they would step in. That's the problem with kids, their training (and pressure) is often under the radar. 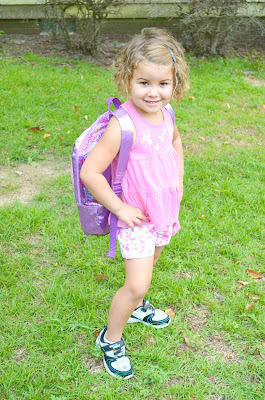 My daughter has those same shoes and the other day some boys in her Kindergarten class told her they were boys' shoes. She responded that she may have bought them in the boys' aisle, but that it didn't matter where they came from but who's wearing them, and she's wearing them and she's a girl, so they're for boys and girls both. (Shared on Pigtail Pals on FB, too.) Tell your daughter to stick her to guns - girls can like anything. Is it weird that this somehow feels so much less of an issue with boys? Or maybe it's just me? I'm grateful I don't have girls, because I really do feel I would be all ranty too. I wonder why that is? I overheard a barista say affectionately to a mom with a boy and a girl in tow, "Oh, those wild boys!" The mom put her arm around her daughter and said "What about these wild girls?!" LOVE HER. Hate that I overheard this "boys will be boys" type comment in the most independent, liberal coffee shop I have ever been in in my life (and I live in a college town, so that's saying something). @Conception Questions -- Yes, I would want to hug that mom! It's up to *us* to teach and reinforce that our girls are just as wild, creative, busy, messy, etc as our boys. If we don't, who will? @Christine - My boy went through a different type of social training. It revolved around displaying his feelings, being a "baby," etc. The Achilles Effect has a great post about the boy side at http://www.achilleseffect.com/2011/08/feeling-blue-about-back-to-school/. My two-year-old son once insisted on taking his toy buggy (which is pink) to the playground with him. Now he's got short hair, and wears fairly boyish clothes – t-shirt and shorts, blues and greens – and I think is fairly obviously a boy. But that day, pushing a pink buggy, the other children assumed he was a girl. I'm struggling with this. Scooby knows he has a birthday coming up so he's all about I want this for Kwissmus. All the new toys are apparently made for girls these days. Some of them I know would be okay, but then there's the ones that are just a little too feminine for a boy. I mean I have encouraged his play with baby dolls, which he beat up and wrestled in that very boy way. He owned a kitchen, which became a race track for his cars. LOL. But when I heard him today "I want dis. It's por boys" my heart broke a little. Even if they are a little too girly, do I really have to tell him that? As for Bella's shoes, just because they aren't pink doesn't mean a girl can't wear them. Who said Toy Story was just for boys? My daughter told me at age 3 she would not wear dresses any more, and now, at almost 8, has almost as many Superhero shirts as not (Martian Manhunter is her favorite). My issue with this is that she sees "boy" as "better", and "girl" as "weaker". So, yes, I push a little girly into her life, as I am sending her to soccer and basketball and buying her new Spider-Man comic books. Because girls will grow into women who need to know that pretty does not equal dumb or weak. You can be pretty and sporty and smart and unique and funny and crazy and muddy and OKAY. That is what I think we should tell our girls. I think it is as much a disservice to steer them away from "traditional" girl stuff as it is to steer them towards it. Provide both, buy the Spiderman shoes, encourage the girly top, and see where she takes it. And also to that end, my boys have had their nails painted when they asked. Don't forget the boys, they are not the enemy. I agree with you 100%, Megan. Just as boys can like pretty things, girls should be able to like tough things -- and neither should carry a greater weight or value. It's not better to be one or the other. It's best to just be who you are and love yourself for it. As the mother of an eight month-old girl who sometimes dresses her daughter in blue (gasp) and gets comments, I can only imagine to how you feel right now. It's time for our society to stop labeling things as "boy" or "girl!" My little girl has the same shoes. :) Once when she was wearing them a little boy told his mom "she's wearing MY shoes" and his mom said "She must love Toy Story as much as you do." He didn't know how to handle that. I've found the preschool set seem far more disapproving of her choices than those being raised at home who haven't had the crowd of peers saying "that's girl, that's boy." The other night, she got to wear a matching 'Buzz Lightyear' nighty with her brother, and someone in my family said "That's a boy nighty you know" and she looked at them and said "Yup, and I like it too! Buzz lightyear to the rescue!" and zoomed away. That's my brave little Space Ranger. She knows far better than they do. The thing is, I was a tomboy. I hated all things girly. My daughter isn't one, she loves girly things, pink and sparkles, Barbie, dolls, everything girly she absolutely adores. She sits and lets me do her hair so it looks beautiful, and she poses for the camera with a whirl of hair and a toothy grin. She just also happens to like bugs, Toy Story, Spaceships, adventure, Superman and the Green Lantern, and a million other things someone somewhere deemed "boys only." So I hate her being labeled a tom-boy or 'not girl enough'. That doesn't fit a princess who's playing mommy to a little baby bug she's caught.